Is this your favorite time of the year? Autumn. It's mine. Always has been. I love the Fall. I love the colors that we have in New England. I love the color of the ocean too. Everything just seems clearer. Void of all the summer tourists. And I love the smells. The smell of apples on the ground. The smell of the woods and fields. It's all so perfectly clear. Especially in light of the fact that Fall is the season before...(gulp) Winter. Everything about this wonderful season is what makes me and my family happy to be living here. I'm sure a lot of you feel the same. Last Thursday was certainly another "bonus day". The remnants of Hurricane Jeanne made her way onto our shores, after drenching us the day and night before. The points were firing and so were the beach breaks. My son and I surfed the Wall after school. The swell was not very well organized, but certainly packed a punch. Max got one of the Bombs of the day and it made the whole session worth while. Funny, how one wave can make your day. The older you get, the truer that statement becomes. 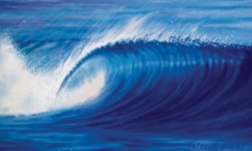 Trust me, one good wave can make your day. I want to thank everyone who came out on Sunday night to see MONKEY PUNK (Grommatically Correct II). I especially want to thank the shops for their support and the ESA-NNE district headed up by Lenny Nichols. But a BIG thanks goes out to Mr Dave Cropper who really helped promote this thing and even played in the Jimi Band. Thanks Dave You're the BEST! The movie seemed to go over BIG. Everyone loves to see themselves surf. The kids are no different. I try to get as many of the kids into my Grom videos as I can. But, I can't shoot everyone all of the time. That's why I ask the parents to provide me with any home video you might have of Junior surfing. Yesterday. 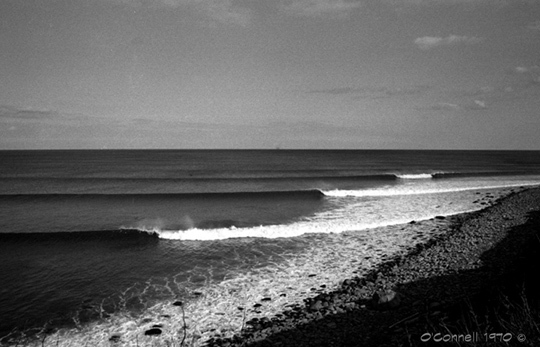 A Lonely 1970 "Empty Line-up"
Local Mike Stanek finds another hollow section in our vast pristine wave field. 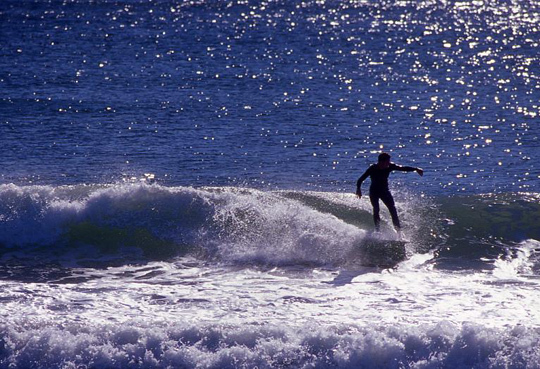 We only have thirteen and one half miles of surfable coastline. Good thing it's chock full of waves like these. Speaking of the movie. The New SFOD Grom Video MONKEY PUNK featuring all the local Groms (under 18) surfing in New England will be released on Veteran's Day (November 11th) and be available at all the shops and online. On Sunday Oct. 17th at the same American Legion Hall on High Street in Hampton, SFOD Presents the Premiere Showing of 13POINT5. Doors Open at 6:00PM for a 7:00PM Showing. Well, I guess that Great White Shark on the Cape has headed out to Sea. I suppose that's cool. But, you know, if that thing took a bite out of me, or someone that I knew and loved, well, I'd have a whole different perspective on the fascination with that celebrity shark. But it hasn't (so far). Still, I bet a lot of you (like me) will wonder what would happen if that thing took one of us humans out. What kind of public outrage would there have been if that happened? The Shark scene would be giddy. Can't ya just hear 'em? "Those dummys let her go! Serves 'em right!" P.S. Please keep Praying for those folks down in Florida. They could use it.